Forgive the use of the "transgendered" word in this cartoon...but it is old. Like me! Thanks to Bobbie for sending it in. 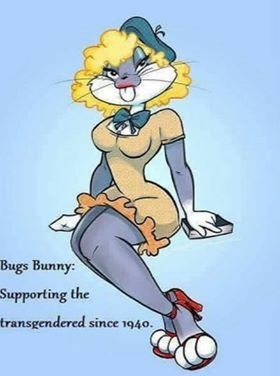 I remember watching, with much interest, the occasional cross dressing of Bugs. Of course, it was a cartoon, so I didn't take it so seriously as to believe Elmer Fudd could be fooled completely. The switch was that Elmer wanted to shoot that Cwazy Wabbit, but was enamored by the feminine presentation of Bugs; just the opposite of what often happens in real life.